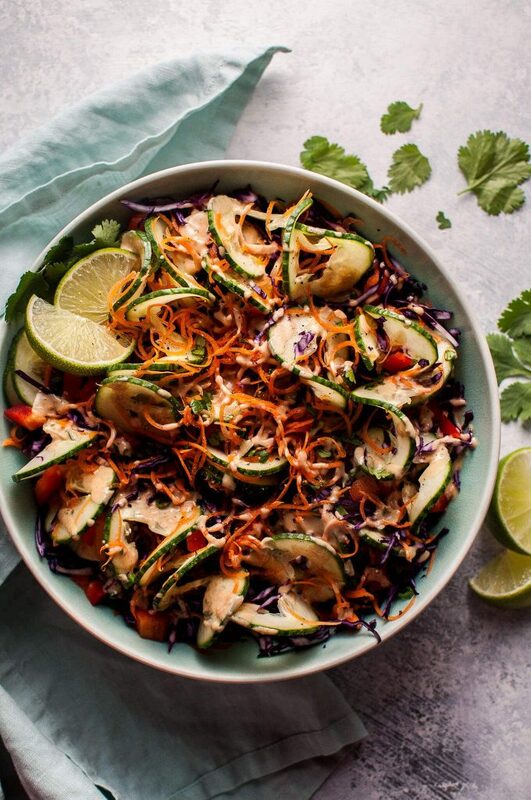 This spiralized Thai salad is fresh, healthy, and has the most delicious cilantro-lime-peanut dressing. Stay tuned for a zucchini noodles recipe coming up not too long from now. I love zucchini, and zucchini noodles honestly make me pretty excited. Stop rolling your eyes, please. Anyway, back to this recipe. I suppose you could make it without spiralizing the veggies, but where’s the fun in that?? This was my first attempt at using the spiralizer, and I went a bit crazy with it. I made a 100-foot long cucumber accordion that my mom and sister complained about having to cut up. You just can’t please those two. At least they liked the taste of the salad. The dressing is super simple… just chuck the ingredients in the blender, and you’re good to go. 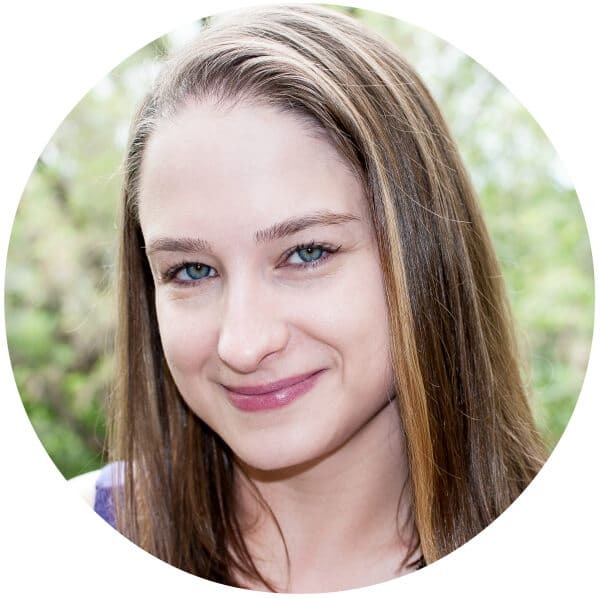 Do you own a spiralizer? 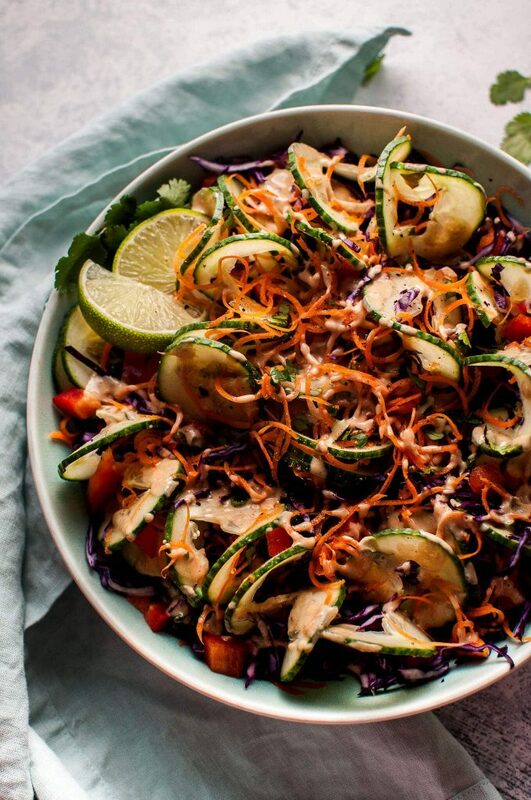 Does this spiralized Thai salad interest you? 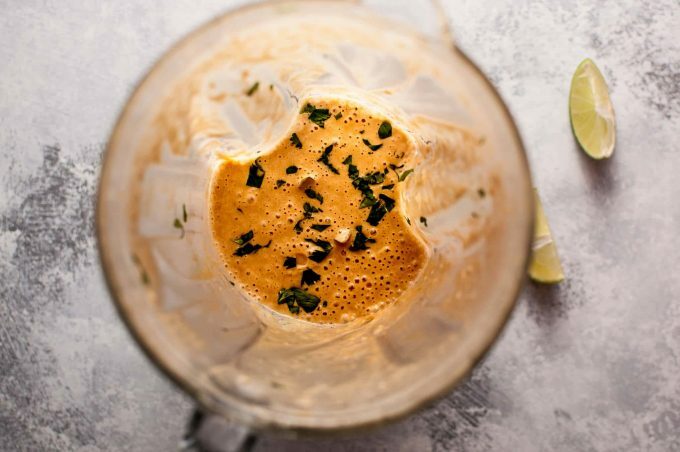 Add the dressing ingredients to a blender and combine until smooth. Set aside. Spiralize the carrot, cucumber, and cabbage on the settings of your choosing (I used the angel hair setting for the carrot, the straight blade for the cucumber, and the chipping blade for the cabbage). Add veggies to a salad bowl along with the red pepper, scallion and chopped cilantro. Pour the dressing over top and serve immediately. You may have some dressing left over. It'll keep in an air-tight container in the fridge for a few days. Love Thai recipes? Check out my Thai quinoa salad, Thai sweet potato curry or my chicken Thai salad. Ha! Ha! If I were your mom & sister I would be happy just having someone make me such a lovely salad. I have a spiralyzer; however, it is buried in one of our offsite storage spaces (a temporary situation turned out to be longer than expected. . .so there it sits). One day I will be reunited with this fun kitchen gadget so that I can make salads as lovely as this one. Omg something you actually made me for once. Can you make it for me again? Aww thanks! Hope you enjoy it! ???? Thanks, Carol! I have a Paderno spiralizer (I put an Amazon.com affiliate link to it in the second paragraph of the post so you can check it out if you wish). I have that one as well but I may replace it with the Inspiralizer because I find it very different to pull the blade out for cleaning when I’m done and the feet don’t stay stuck to the counter. the Inspiralizer has a handle that make the suction feet stick. Not sure if I’ll buy a second one but I do use it a lot. Let me know how the Inspiralizer works if you do get it! Add in green apple matchsticks and fresh mint!